The Art of Naming: What is Your Favorite Max Name? I asked another popularity question recently. "Which Max name is your favorite?" Then I listed them from the most-popular to the least. 74 votes were cast and there were three top names. 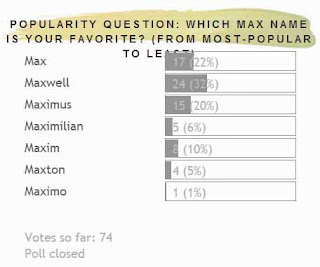 32 percent of you name-artists prefer the name Maxwell and 22 percent would rather go with just plain ol' Max. 20 percent, myself included, voted for the cool Latin Maximus, and 10 percent chose to drop the -us and go with Maxim. The very-long Maximilian only received 6 percent of the vote while the made-up-sounding Maxton had 5%. Bring up the rear was the Spanish Maximo with a single vote. Let's learn more about these names. Do they all have the same root or do they differ? Maxwell is actually related to the Scandinavian name Magnus. It comes from a Scottish surname that means "Mack's stream" from the name Mack which is a short form of Magnus combined with the Old English "wella" which means stream. It was most popular in the US in 2000, ranking at #113 with 3,364 births. In 2012, there were 3,187 boys born (and 8 girls) which ranked the boy's name at #116. Max is most known as a short-form of Maximilian (which came from the roman family name Maximilianus which came from the Latin Maximus meaning "greatest) but obviously it can be short for any of the above names, or stand on its own. Max was rather popular from 1914-1938 before it slightly declined in usage. It increased again around 1987 and has been on the up-and-up since then. Its highest rank was in 2011 at #96 with 3,946 births. It fell to #105 last year. Max ranks very well in other countries too. Maximus is the name I chose for my own son. It is a Roman family name that is derived from the Latin Maximus meaning "Greatest". There was a Saint Maximus in 7th century Constantinople who was a monk and theologian. Maximus ranked at #206 in 2012 with 1,835 boys born. It first appeared on the chart in 1997 and gained popularity after the 2000 movie "Gladiator" came out. It had 11 births in 1999, 188 in 2000 and 892 in 2001. Maximus seems to be the root name for many of these other variants. Maxim is a variant of the Russian Maksim which comes from Maximus. Maxim ranked at #683 in 2012 with 344 births. This name is also popular in England/Wales, Belgium and the Netherlands. I think it is a cute name on its own, or as a nickname for Maximus or Maximilian. Too bad there is a racy magazine with the name that somewhat taints the awesomeness of the name Maxim. Maximilian, again, comes from the Roman name Maximilianus which comes from Maximus. There was a 3rd century saint and martyr with the name. In the 15th century, Holy Roman Emperor Frederick III blended together the names of generals Fabius Maximus and Cornelius Scipio Aemilianus to get Maximilian for his son. In the US, Maximilian ranks at #464 with 582 births in 2012. When it is spelled with two L's, it ranks at #1279 with 136 births. Maxton doesn't seem to have a solid history that I can find information on. It reminds me of a modern-sounding name like Paxton, even though Paxton does have a history behind it. No doubt parents wanted the nickname Max but were not a fan of the other long-forms. There were 5 Maxtons born in 1927 and 1953; it wasn't used again until 1985. It ranked at #884 in 2012 with 235 births. Maximo is a name that I originally considered before falling for Maximus. It is the Spanish form of Maximus pronounced MAHK-see-mo. There were 5 births in 1903 and then it gained regular usage in 1914. It first entered the top 1000 chart in 2002 at #933. In 2012, it ranked at #920 with 222 births. It is more popular than it has been in the past but it is still fairly unused. A handsome alternative to more-popular Spanish boy names that end with -o. Add that up, you get 11,505 "Maxs" born in 2012. 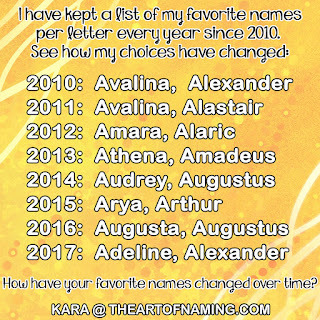 Which is your favorite Max name? Let me know in the comments below!